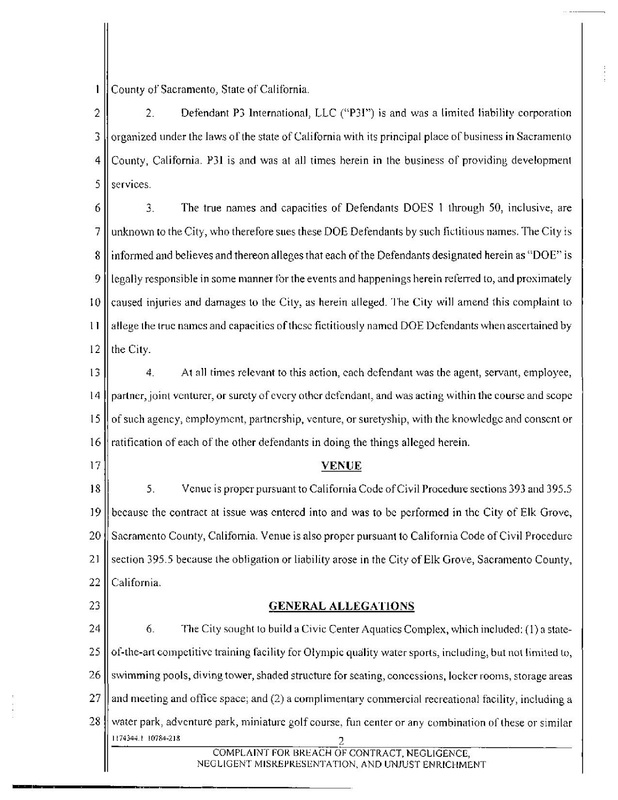 The City of Elk Grove has filed a lawsuit against P3 International (P3I) for negligence and breach of contract over its handling of the city's troubled proposed aquatics center. 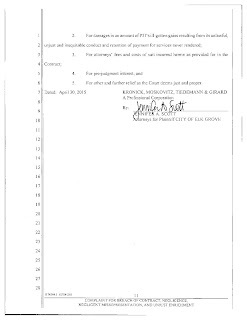 A discussion of the lawsuit will be part of this Wednesday's Elk Grove City Council's closed session. 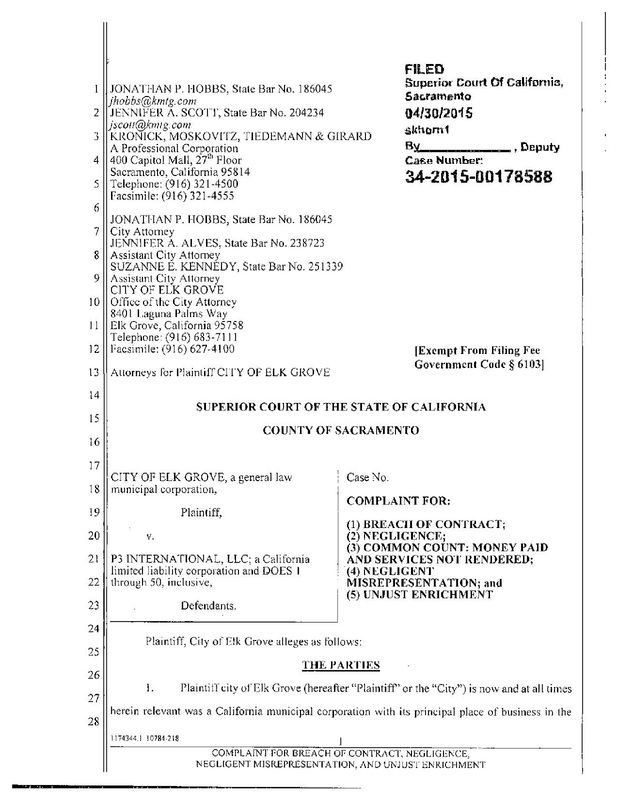 The lawsuit was filed in Sacramento Superior Court on April 30, 2015. 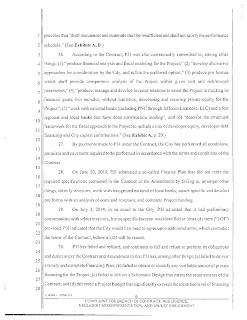 According to the filing, P3I and its principle, Jeroen Gerrese, are in breach of a $695,000 contract for failing to deliver a financing and construction plan for the city's proposed Olympic-class aquatics center. 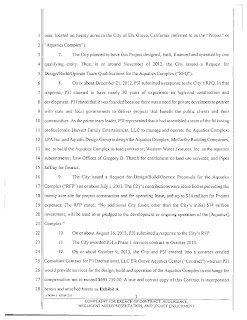 The City awarded a contract to P3I in September, 2013 after they were the only company who bid to develop a financing, construction and management plan for the city's proposed aquatic center. 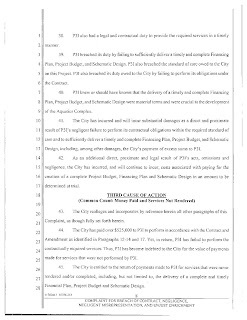 Among the five causes of actions listed in the lawsuit, it is asserted that "The City has paid over $525,000 to P3I...Yet in return it has failed to perform the contractually required services. 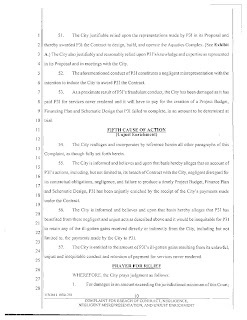 Thus P3I has become indebted to the City for the value of the payments made for services that were not performed by P3I." 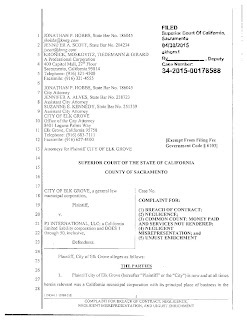 At their September 10, 2014 meeting the Elk Grove City Council was advised by City Attorney Jonathan Hobbs that P3I was in breach of contract. 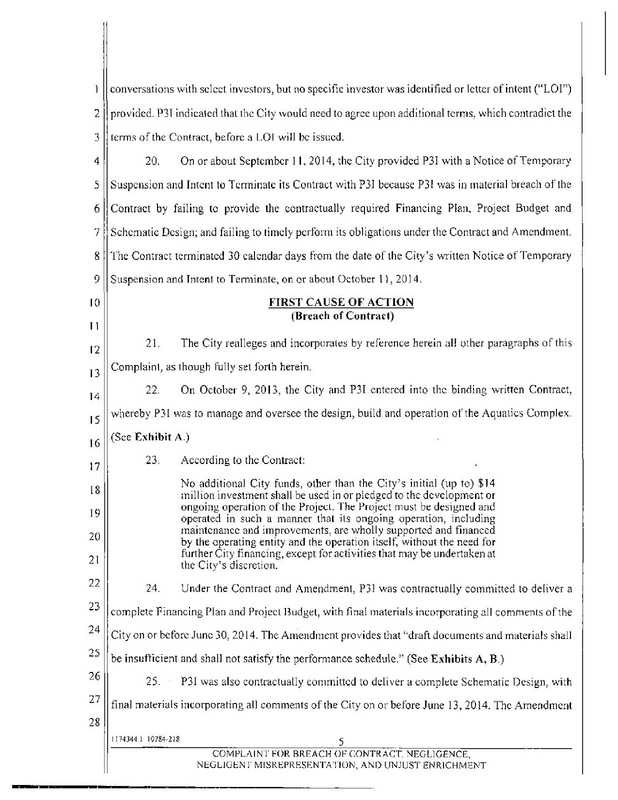 Although the city council decided in their closed session meeting on November 12, 2014 to pursue the lawsuit against P3I, it was not revealed at the time. 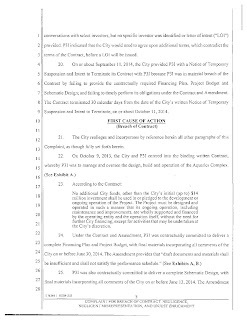 At the September 10 meeting Gerrese was not invited to speak during the hearing on the failed aquatics center plan, but did speak during public comment. 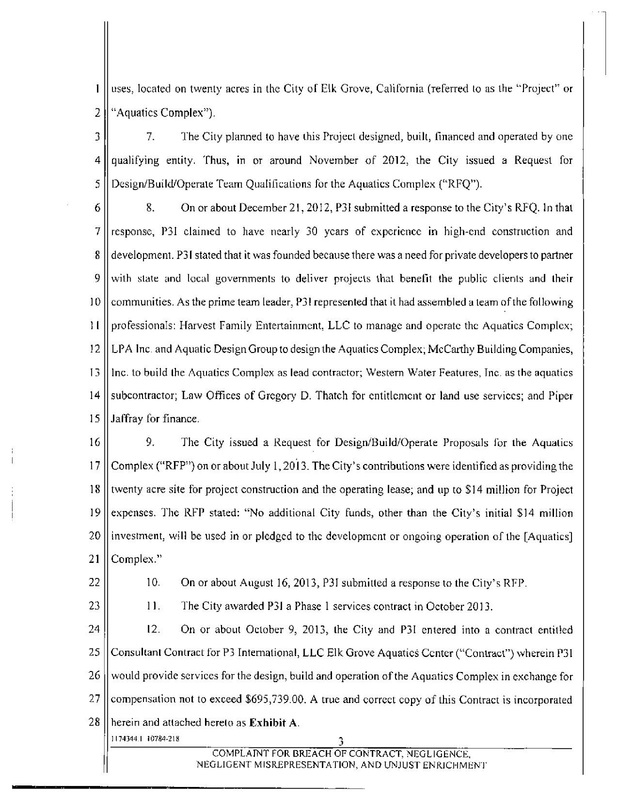 In his defense, Gerrese said among other things hobbling the aquatics center were 12-percent interest rates financiers demanded to finance the project. Gerrese did not respond to an email inquiry and the phone number listed on P3I's website was disconnected. No hearing dates have been set for the lawsuit. See complaint below. Click on each image to enlarge. Back in 2009, when the Elk Grove Community Connection hosted a town hall meeting on the Civic Center, hosted by then Mayor Pat Hume, Pat talked briefly about public/private partnerships as a way to finance the civic center and all that will come with it. 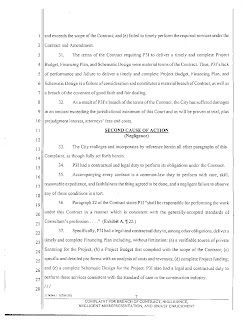 As I recall several citizens spoke before the city approved this contract warning them that entering into this contract was a mistake due to M3I's lack of experience with this scope of project and warned them to use caution due to the other RFP candidates dropping out. No one stopped to reason why. Not our council. Full steam ahead, we ain't scared of no icebergs. Bit in the rudder again. Taxpayers fund a lawsuit that should never have been. 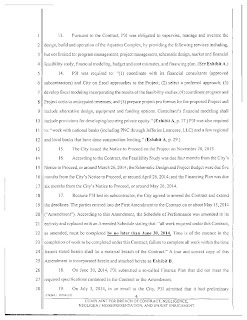 It appears our city failed in all "Ten Principles for Successful Public/Private Partnerships.” The people had many questions about awarding this contract to P3 in the very beginning along with problems with the water playground, but were classified a nay sayers. 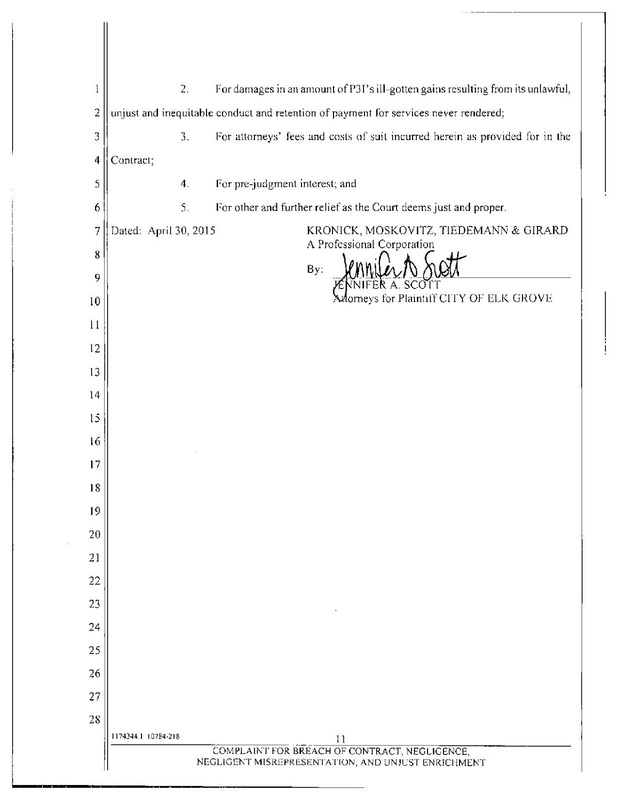 Why did we not ask for regular updates before issuing checks? Much as many of us see in the Sports Complex planning to date. It seems as if we're slow learners. 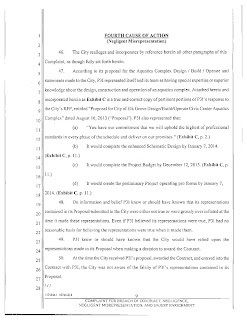 But then again we do have that Durham, North Carolina expertise at work again, so maybe all will work out in the end. This was all a hugh boondoggle from the beginning in many ways. 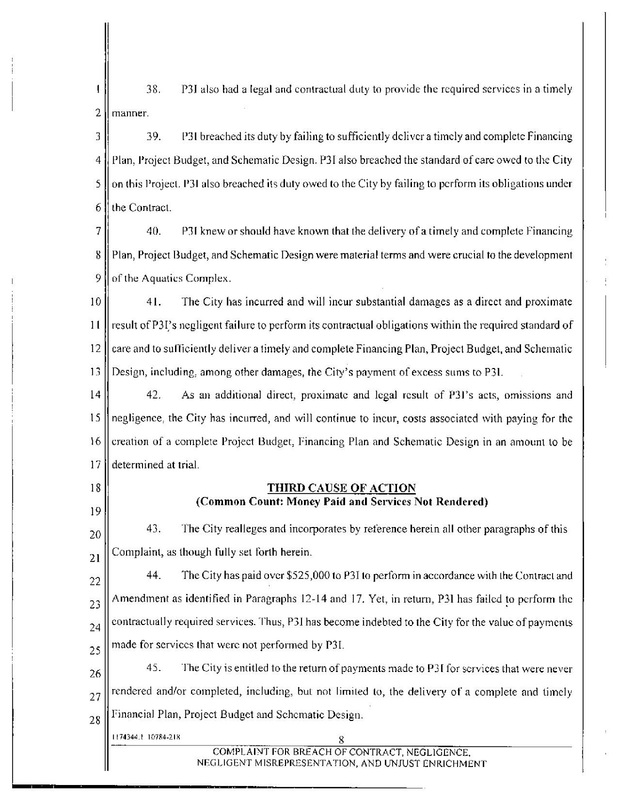 As for the financing....didn't I read where they did get some financing, but was just too rich for the council...12%? Well, what do you expect for such a risky "Olympics" project? Probably be thrown out of court. Then after all this we start down another path of no return, a MLS Stadium to seat 9,000 and if Mr. Detricks lead is followed, seating for 20,000. We just never learn do we? It's all "BIGGER IS BETTER." We elected a bunch crooks to lead our city, they repeatedly entered deals with other crooks, thinking that they could outwit the other crooks. Our city leaders are gambling our futures and our integrities down into THE DEEP PIT. Their conducts reflect our values. In pulling up the web site for the company that was to design this pool, "Aquatic Design Group", I see their web page is stale. Latest updates were in 2013. Is this perhaps another problem in getting financing? 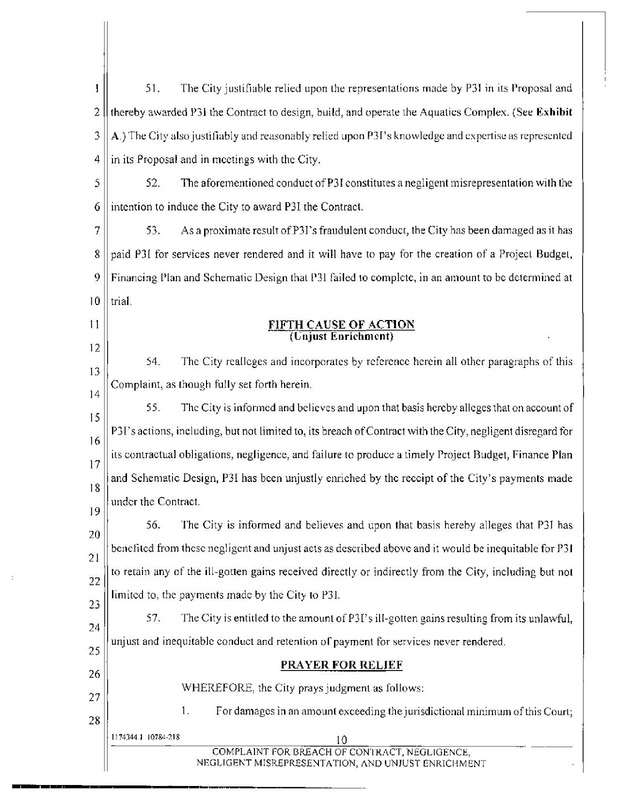 I noticed in the lawsuit that the City is suing P3, but since it is an LLC, the actual names of the persons are unknown. 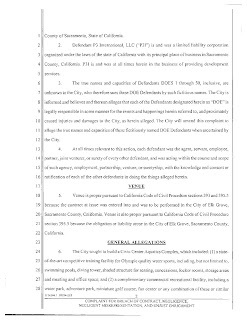 The lawsuit states that once their identity is revealed, the City will sue them as individuals as well. 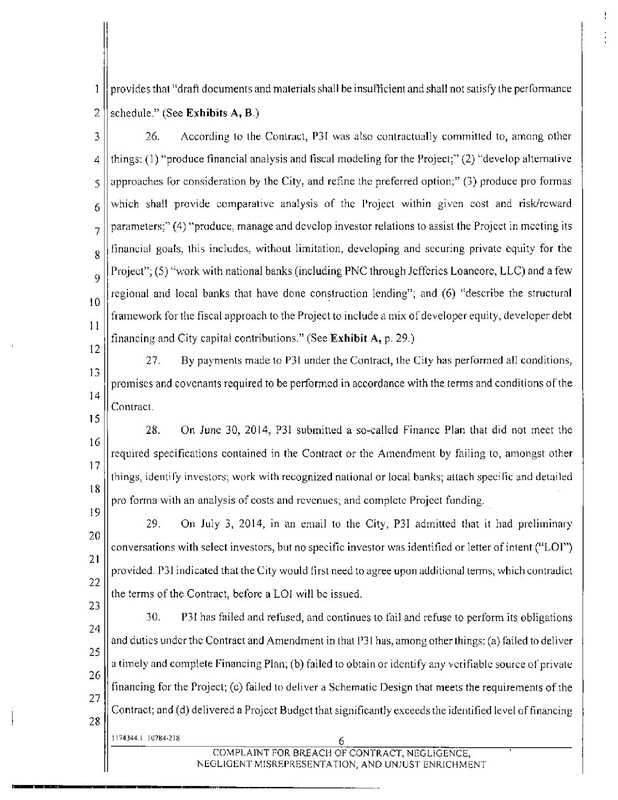 My armchair law book says that LLCs (Limited Liability Corporations) generally protect the personal assets of the individuals, so my crystal ball says P3 will file bankruptcy and the City won't get a dime...except for Hobbs. 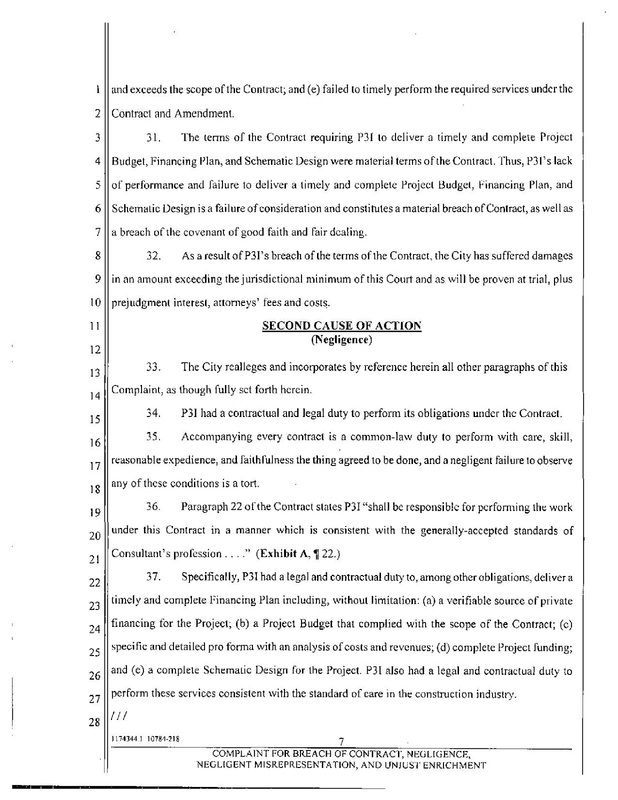 But the Council will give a valiant effort to give them PR soundbites in an attempt to cover their politically foolish decision to enter into the contract with P3 to begin with--as the contract was written it was begging for a rip-off of the city. Listing here for 2010-2013....maybe gone on an extended vacation with Nunez, paid for by the EG taxpayers! The ITB project can be seen here. 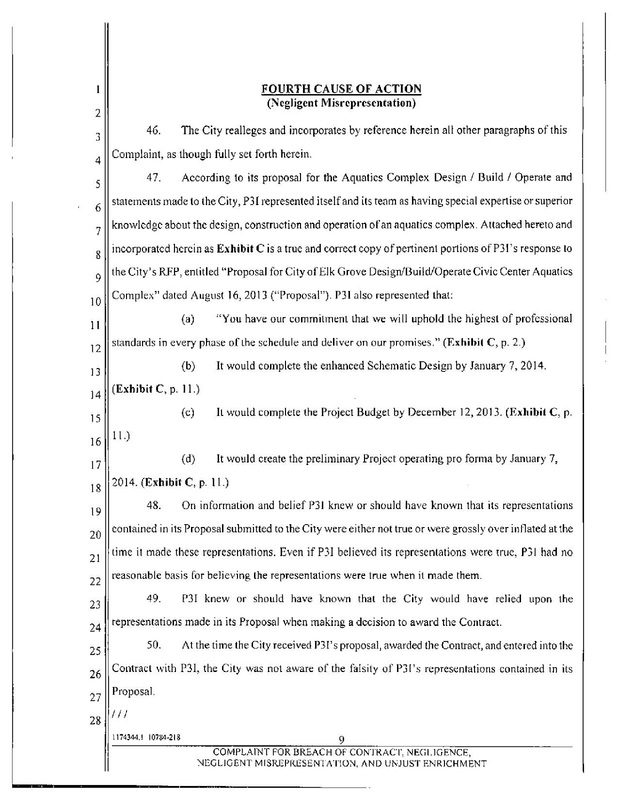 Deadline 7-30-2015 and as I understand it should come before council in August. 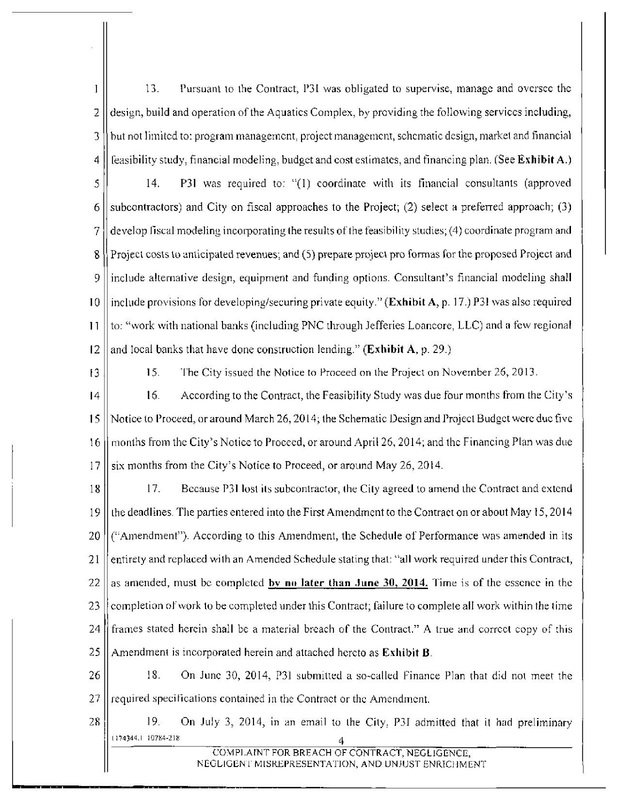 Lawsuit won't slow the city down...the taxpayers purse is overflowing.